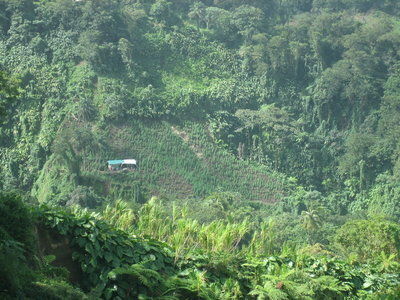 Big marijuana farms, like the one visible at the center of this photo, are common in St. Vincent. 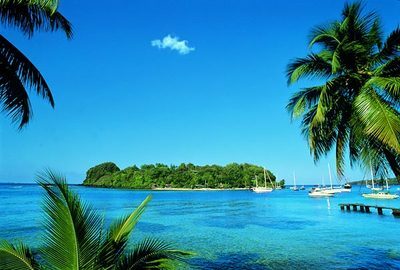 ​The United States claims that the archipelagic nation of St. Vincent and the Grenadines is “the source for the majority of cannabis” in the Caribbean. “According to officials, marijuana producers have recently started labeling their product for export,” says the U.S. Department of State’s 2012 International Narcotics Control Strategy Report, according to the Antigua Observer. St. Vincent and the Grenadines has more than 300 acres under marijuana cultivation, according to the State Department, based on information from local officials. 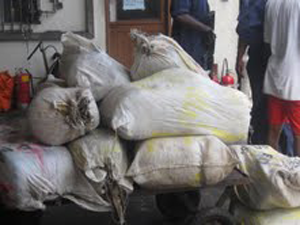 These 11 bags containing 472 pounds of marijuana were seized by the St. Vincent and Grenadines Coast Guard last May. Three men were arrested; authorities claimed the weed was worth $4 million. Vincentian authorities during 2011 reported 522 drug related prosecutions, 322 convictions, and 432 people arrested for drug offenses, according to the report. I mean come, get real. You never thought this was about anything besides getting more Yankee government dollars, did you? “Narcotics play a major role in the economy, causing a dependence on cannabis in large population segments,” the report states. “The government officials have stated they cannot combat the long term effects of the drug trade solely through enforcement,” the report says, stating that while Drug Abuse Resistance Education (DARE) programs are used in schools, there are no rehabilitation clinics. ​Vincentian officials estimate that 30 percent of domestic “drug abusers” use cannabis, while just two percent use cocaine, according to the State Department. The report noted that the administration of current Vincenteian President Ralph Gonsalves is drafting a National Drug Plan with, surprise surprise, “assistance” from the Washington, D.C.-based Organization of American States (OAS), and has set up a new Forensic Drug Laboratory in Kingstown. The report noted that no new drug enforcement-related legislation was passed or was pending in St. Vincent and the Grenadines in 2011, adding that no laws there require specific record keeping on the importation of pseudoepehedrine, ephedrine and pharmaceutical products containing those two chemicals, which are precursors of methamphetamine. The State Department noted that the news media “routinely report on instances of corruption reaching high levels of government that are not investigated or go unpunished … analysts believe drug trafficking organizations continue to elude law enforcement agencies through bribery, influence or coercion,” the report said.